As regular readers here will know, I’m a huge Disney fan. I love the “golden era” Disney movies; I’m not sure whether I should admit this, but I can sing along to a scary amount of Disney songs. I’ve been so excited since Disney returned to doing musicals. For me, it hasn’t really mattered whether it’s CGI vs hand-drawn (or even live action, to be honest), or fairytale vs non-fairytale; what I want are sing-alongable songs and pretty scores. While I loved Enchanted, I wasn’t that impressed with The Princess and The Frog, mainly because I didn’t like the music. So I had been curious to see how that would turn out with Tangled; which way would it go? 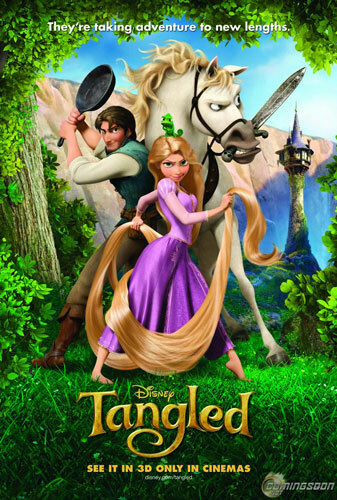 Tangled takes the tale of Rapunzel, but adds a whole new extra back story, new characters and magical hair. As a child Rapunzel (Mandy Moore) is kidnapped by an old woman (Donna Murphy) who needs Rapunzel’s magical healing hair to keep her young and immortal. Her “mother” keeps her locked away in a tower, telling her it’s for her own good and that the world is too scary and dangerous a place for someone like her. But when a dashing bandit, Flynn Rider (Zachary Levi), discovers Rapunzel and her tower, she demands to be shown the outside world. I got to see Tangled two months ago, and ever since seeing it I can’t stop listening to the soundtrack! You’ve got all the usual suspects: the cheerful opening song (When Will My Life Begin), the evil villain song (Mother Knows Best), the side character song (I’ve Got A Dream) and the love song (I See The Light). I was initially a bit underwhelmed by When Will My Life Begin and Mother Knows Best, but after listening to them more, I actually really like them. The other two (I’ve Got A Dream and I See The Light) I loved the moment I heard/saw them in the cinema. Although the scene for I See The Light with its lanterns makes it difficult not to love that song; it’s just so fitting and romantic. And that brings us to the CGI and the 3D. The lantern scene is gorgeous, and the prettiest use of 3D I’ve seen so far. I was expecting to miss the hand drawn animation, but the CGI in Tangled is great. It somehow was very reminiscent of hand drawn animation, with the characters having the same vibe as hand drawn ones (read Bleeding Cool’s interview with Glen Keane, he’s had a lot to do with that). I also love the relationship between the two main characters. In most Disney movies you’ll find a strong lead character and a weaker less-prominent love interest. 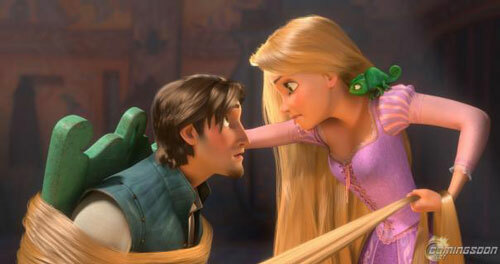 With Tangled, both Rapunzel and Flynn get time to grow and they’re both equally strong characters. Rapunzel is sweet, yet one of the feistiest Disney princesses. I think she’s my second favourite princess so far (with bookworm Belle being still #1). Flynn is great as the swashbuckling rogue, although I can’t really say much more about this character without spoiling the story. 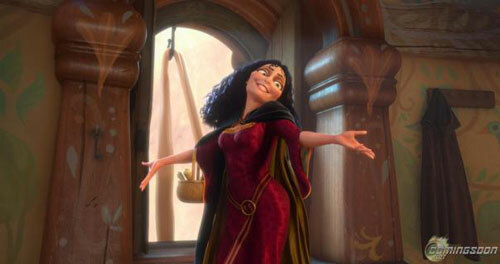 Mother Gothel isn’t the scariest villain, but definitely the most manipulative one (although Jafar comes close behind). Pretending to be Rapunzel’s mother and basically guilt-tripping her into staying in a locked tower, Gothel is a twisted portayal of the over-protective mother. Finally I’ve got to mention the horse Maximus. Maximus has some of the funniest moments in the movie, even though he acts more like a dog than a horse. Tangled was everything I was hoping it would be. It’s got a sweet story, two strong main characters, adorable and funny sidekicks, catchy songs and gorgeous visuals. I really want Disney to do more musicals, cause they’re just so much fun!